This post is just in case there is anyone out there on the internet who is new to mainland Europe and needs to attach a German style (i.e. continental style) electric plug to something. Well, it could happen. And if you are that person, welcome! This post is just for you! 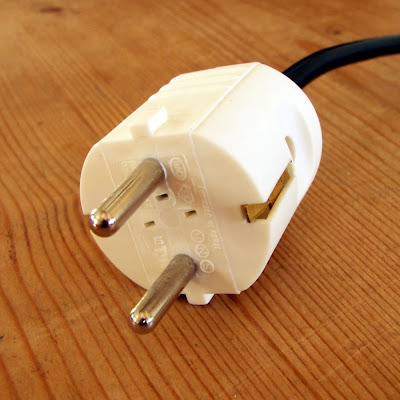 With us, coming as we do from the UK, the change is from a three-square-pronged fused electric plug to a two-circular-pronged plug. Or a 'Stecker' as they are called in German. 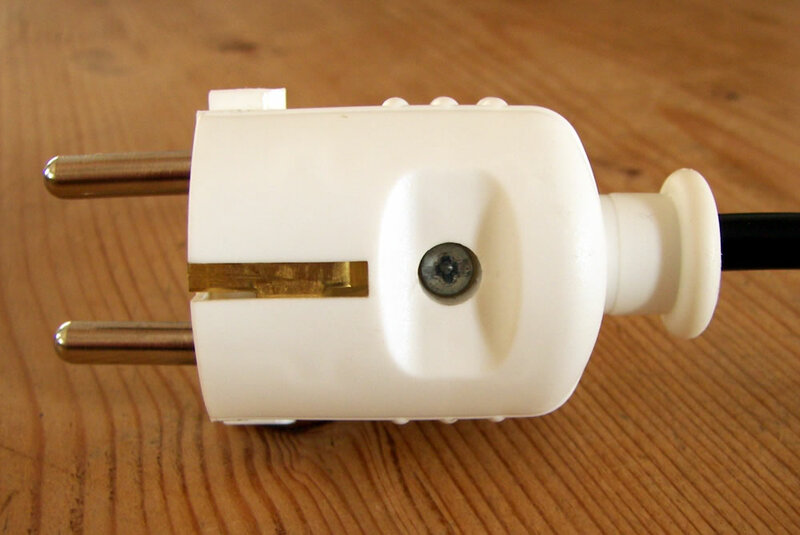 For a while you can get away with using travel adaptors on your electrical equipment from the UK, but this is not to be recommended. Particularly when you need to dry your hair and you can't find a spare one anywhere. But also as this is not really a good choice from a safety point of view. At some point you are going to have to replace your solid, square, British plugs with curvy round European plugs. The first thing to ponder, is that there are only two prongs. Which is the 'earth'? The answer is that the earth is supplied by the two contact strips at ninety degrees to the prongs. The second question then is which prong is positive and which is neutral? The answer is that it doesn't matter! 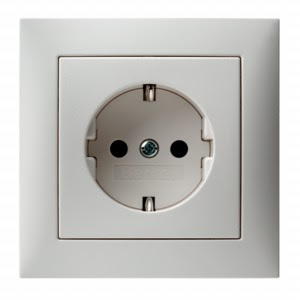 Of course, with a circular plug you can stick it in the socket ('die Steckdose') either of two ways. 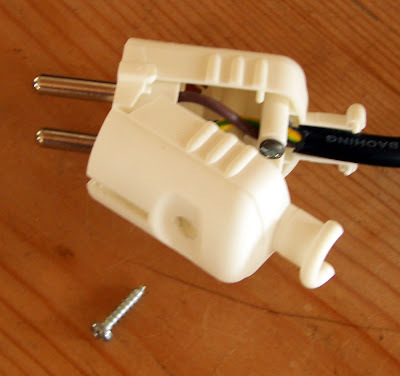 Which prong is positive and which is neutral is immaterial. How do you open up a plug then? Simple! There is a single screw in the casing that needs to be undone. It's then just a matter of aligning the wires with the correct terminals (blue/neutral and brown/live either left or right, green-yellow/earth in the centre) and screwing them down. The final question (I hope) is 'what about the plug's fuse then?'. The answer is that you don't need one! 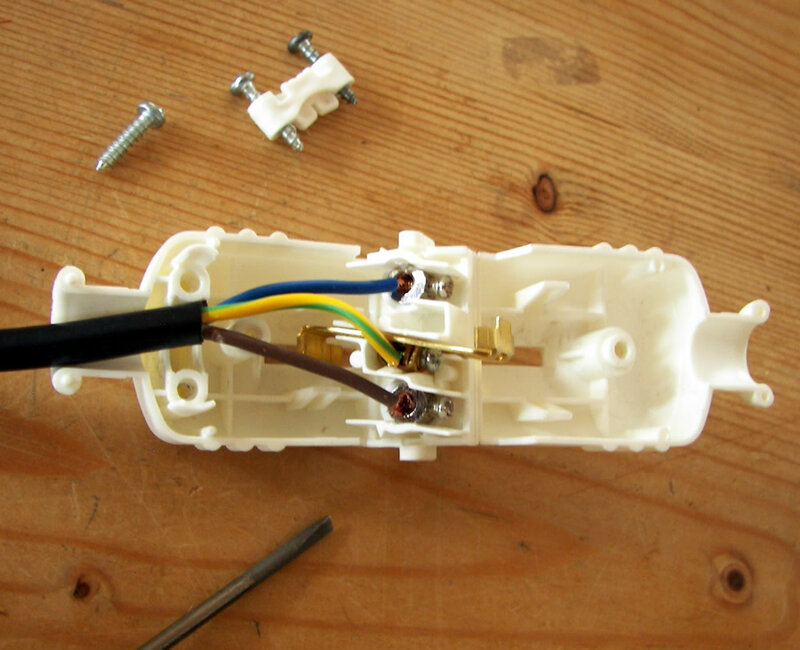 If you look at the electrical connection box that you have in your German house or apartment you will find quite a number of circuits with trip fuses. 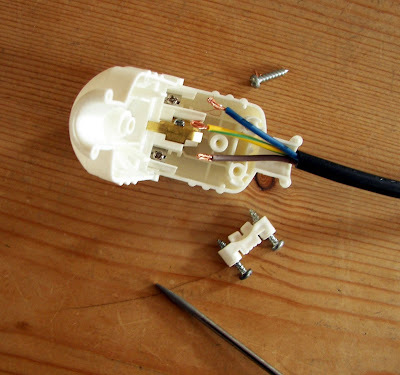 The benefit over UK-style ring mains is that if you grip a bare wire in an electrical device then the current doesn't run through you to ground until a fuse in the device blows (hopefully sooner rather than later), but rather a trip-fuse will cut off in the connection box. 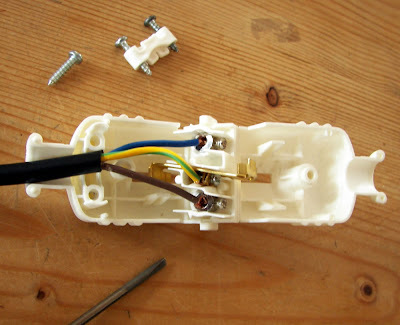 It means more complicated wiring, but on the other hand it means that all the lights don't go off in the house because one device has fused, and you end up trying to find some fuse wire in the dark with a torch. The job's a good 'un, and don't you feel silly for having to google for how to explain how to do this? More to the point, don't I feel silly having spent half an hour putting together a blog post that nobody will probably read? Disclaimer: I am not a qualified electrician by any stretch of the imagination, and give no guarantee that the advice given here is correct in the slightest. If you end up with black frizzled hair sticking up on end, or worse, then don't come complaining to me. I accept no liability for houses burnt down, death through electrocution, or your TV blowing up. If in doubt, seek out a proper electrician ('Elektriker' or 'Elektrikerin') and don't rely on anything you read on the Internet!